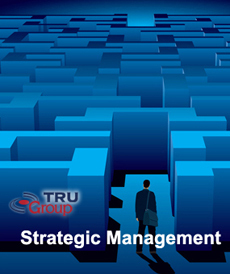 TRU Group Inc provides comprehensive Integrated Solutions for customized strategic planning, analysis and modeling. Customizing the approach for your situation is vital since there is no such thing as a general fits all textbook template, approach or model [such as Blue Ocean or Balanced Scorecard] for strategic planning in the manufacturing sector. In the increased complexity and challenges of the 2016 environment, strategic planning involves much more than management discussion! TRU Group Strategic Management for manufacturers & industry is a practical sophisticated approach developed over twenty years of intensive involvement in all aspects of strategic planning and analysis. Our process for strategic planning is engineered to activate strategy - including ensuring the integrity and validity of the plan. Our market research provides the essential foundation for strategic planning, our facilitated strategic planning huddle resolves strategy issues and our focused marketing delivery supports strategy implementation. TRU Group technical manufacturing orientation is beneficial since product or production technology are integral to your business and can be strategically challenging. Call TRU Group on activating your strategic planning!